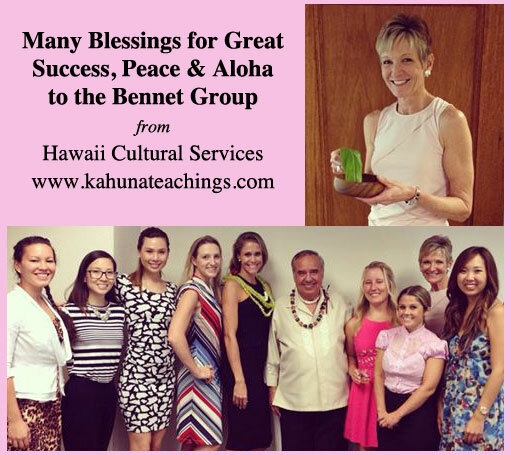 The Bennet Group Strategic Communications, Hawai`i’s award-winning and third largest PR firm by revenue, celebrated the relocation of their office within the Dillingham Transportation Building with a Hawaiian blessing performed by Kahu Silva. Assisting Kahu with the ceremonial pi kai (sprinkling of salt water) purification rites were President and CEO Joan Bennet, Senior Vice President Monica Salter, and Senior Account Executive, Emma Wo. Joan held a koa bowl filled with Holy waters collected and untouched by human hands, from sacred sites throughout our islands and sprinkled it using sacred green ti leaves. After the blessing, Kahu shared an ancient kahuna hā (breathing) ritual with the Bennet Group `ohana (family) to relieve the daily stress and to achieve a state of pono (inner peace). The blessing concluded with everyone enjoying the traditional pa’ina (food offerings).